Referring Search Engines and much more. These reports are easy to read in either table or chart form and the data can be exported into Excel for you to analyze. When used correctly, this information can help you make informative decisions about internet marketing or website enhancements. For $2.99 per month prevent yourself from wasting money implementing programs based on assumptions and get the facts. It is well worth the extra expense. Does your website use Cascading Style Sheets? If not, how come? A CSS file allows you to select your font style (bold, italicize, underline), size, color, and other elements for your website in a single place. This greatly helps with consistency and editing of your website. Creating a CSS file from scratch can be a pain if you’re not familiar with writing code. Web Safe Fonts is a useful website that provides the code you need to stylize your font exactly how you wan t it. Not only does this site provide code to create your CSS sheet; it provides a list of many web safe fonts and an area for you to test your own content. You will now have all the correct code for the exact style, size and color of the font you want. If you're familiar with CCS files, how do you work with them? Throughout most of the world it does not matter when driving if you speak the language or not. A red octagonal sign means stop, a yellow triangle means yield, and so forth. The same is true for website development. This morning I needed to place an order for more toner. I was brought to a Japanese website. Not an English word in site. However in the upper right hand corner was a small world icon and when click opened an interface that allowed me to select English and complete my order. Why did I look in the upper right-hand corner? I don’t know, however that is where I expected that type of info. Visitors have expectations where to find various bits of info; navigation should be located on the top or left side; search fields are usually near the upper right; logos placed in the upper left; ads tend to be placed on the top or right side, etc. An interesting test (Provided by Human Factors International) is to draw a 5x4 grid on a sheet of paper. Give an ideal customer a list of items that you wish to include on your site and ask them to indicate which box each should go (more than one can be in a box). Repeat with several others. Look for consistencies and design or adjust your website accordingly. Lastly sprinkle a few icons throughout your website. The use of icons and color will help a person understand what a page is about long before they will read the content. If it wasn’t for the small world icon, I would have been lost. Lee Oden recently conducted a reader poll to find out the Best Keyword Research Tool. Keyword Discovery and Wordtracker rated the highest. Keywords and more importantly keyphrases are one of the greatest overlooked areas when creating a website. Find out what words and phrases your ideal customer is searching for and make sure that you integrate them throughout your website. Looking for an inexpensive way to promote your product or service and have a computer? Build a self running PowerPoint presentation that with showcase your products/services. A different product image can be placed on each slide. Text is optional. Transitions can be set and the file should loop. Display it anywhere you have traffic. If you visit clients with a laptop, it can be converted to a screensaver to be automatically used anywhere. Every company has its internal debates, and at VCS we are no different. One of our on-going debates is the difference between high quality illustrations and clipart. Where is the line drawn? Inevitably we seem to know which is which when we see it. Custom illustrations are consistent, thought out, and drive a message of quality. Generic clip art is mismatched, not consistent, and can often detract from your message. Until recently, if you wanted custom illustrations for your presentation you would have to find an illustrator. Now there is another option. PointClips recently sent us sample to evaluate. Our findings: this is not your everyday clipart, but rather quality illustrations that you can resize and recolor right in PowerPoint. Within their 4 categories, there is something for everyone: Business Basics, Objects & Equipment, Networks & Tech, and People @ Work. Images can be purchased individually for $5, or in a package of 50 for $99. 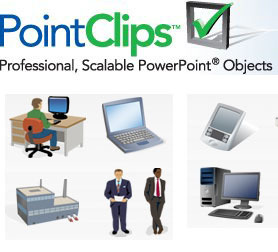 Looking for an upscale way to enhance your presentation, visit http://www.pointclips.com/. “Give Your Website a Greater Purpose” is not only our tagline but our central belief. I bring this up, because Dell has done just that. What does Dell do? Sell computer hardware, right? I am not in the market for a server or computer system, so why would I spend a large amount of my morning at Dell.com? Dell has begun Studio Dell: an online video resource broken down to 3 main categories; home, small business, and IT Pro and then further broken down to many sub categories. This is a great example of giving a website a greater purpose while strategically targeting their audience. In the end, I still didn’t purchase a computer (this time), however I did look to see what they are offering today.